This four storey tower house, seat of the Tyrrells, was built in c1410. It guarded the only piece of passable land through the surrounding bog. The Tyrrell family became very wealthy from the tolls collected. Captain Richard Tyrrell led a famous victory over English forces in 1597. 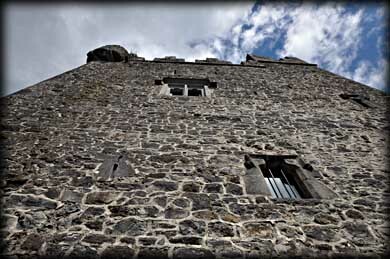 At the east end of the tower house is a narrow fifth storey forming a long turret the width of the castle. The castle is topped with Irish crenellations. There are bartizans on the western angles. 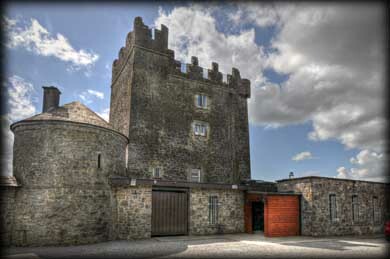 Also present is a tower attached to the castle by a wall, this may have formed part of the original bawn. The castle has been converted into a restaurant. Pictured above is a pointed doorway in the east wall, a single light window and a bartizan on the southwest corner. Situated: Easy. From Dublin head west on the M6. Take exit 4 for Tyrrellspass. The castle is at the west end of Main Street (R446). Discovery Map 48: N 4114 3751. Last visit April 2012.